So it seems the butterfly has caught my eye. Actually I've been sitting out a tool or stamp set that hasn't seen much use lately and leaving it out until I use it for 3 projects. This card is project #3 for the Martha Stewart butterfly punch. Project #1 was the card candy I made for a swap at Inspire Swap Chat, project #2 was the thank you card and here is #3. My original thought was to have all cream butterflies on the cream card but I still had a few scraps of the gold paper sitting out and I thought the two together looked very elegant. 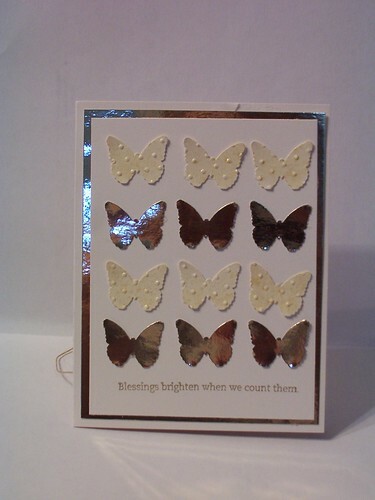 I added some gold glimmer mist to the cream butter flies after I embossed them in the cuttlebug folder.